TPO roofing materials are formulated using the best available technology and designed for long-term roof performance in all conditions. Reinforced with a TPO membrane with polyester fabric to provide excellent wind uplift resistance, puncture resistance and finished physical properties. TPO roofing systems are a flexible, thermoplastic membrane manufactured using UV-resistant polyvinyl chloride to withstand the test of time even under some of the toughest conditions. TPO roofing membranes are an ideal long-term solution for roofs that demand high performance at a lower life cycle cost. 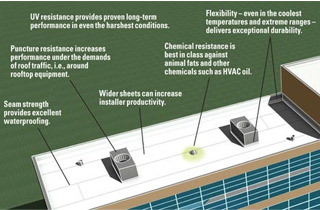 A Johns Manville TPO roofing system gives you a reliable, cost-effective roofing solution. 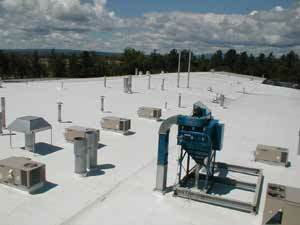 Johns Manville TPO roofing system membranes are reinforced with a polyester fabric and manufactured using an ultraviolet-resistant thermoplastic polyolefin formulation.